Are you planning a fall trip to the beach? Well good news, the festivities don’t end just because summer time is over. After enjoying a walk on the beach or relaxing in the lazy river, head over to the Market Common for some family fun. Just a quick 5-minute drive from Paradise, you will find activities for everyone to enjoy from shopping and dining, to the Annual Christmas Tree Lighting. And if you just can’t get enough Christmas, don’t fret, there are plenty of Myrtle Beach holiday events taking place along the Grand Strand. If you want to make an entire day at the Market Common, head over to Howard Avenue Saturday afternoon before the Christmas tree lighting. Peruse the handmade and locally grown vendors at the Holiday Bazaar. From 12pm-4pm you will find seasonal craft vendors, live greens, and fresh food. So if you are looking for some unique items that support small businesses, check it out! You may even be able to squeeze a movie in at the Grand 14 before making your way to the Annual Christmas Tree Lighting. Get ready to sing along to joyful carols or strike your best pose with Santa Clause, because he is coming to town to light the tree at the Market Common. 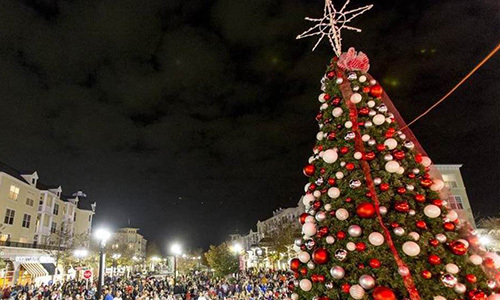 The Annual Christmas Tree Lighting, held in front of the Grand 14 Theater, will be Saturday, November 17th from 6-8pm. Bring the whole family down to play carnival games, get faces painted, and ride the trackless train down Deville Street. You can even take a complimentary carriage ride between 6pm and 9pm. You won’t want to miss this Christmas magic! So plan ahead, pack some chairs and blankets, and get ready for some holiday cheer! If you have ever been to the Murrells Inlet Marshwalk, you know that it offers spectacular views and scenery that are hard to beat. But in the winter time, it gets even better. Check out the Marshwalk Wonderland of Lights for an enchanting evening by the water. You will walk through thousands of cascading lights and twinkling tunnels, leading you to the row of restaurants that each have their own spectacular light displays. It will be a magical evening, but it won’t be quiet. Enjoy the sounds of Christmas cheer spreading its way across the inlet as the lights flash in sync with the holiday music. This will be a light show you will never forget! After you have caroled and danced your way through the holiday festivities, head back to Dayton House Resort to relax in the indoor lazy river or feel the cool fall breeze while you watch the sunset. Everything you need is right at your fingertips, just let us do the planning and you relax. We can’t wait to make this holiday season the most memorable yet for you and your family.